HoofSearch is a new monthly guide document indexing new peer-reviewed research, academic papers, conference proceedings, and patents covering hoof science, equine lameness, biomechanics, imaging, and related topics like equine metabolic syndrome, footing studies, and racing, breed, and sport-specific lameness research all in one interactive document, available 24/7 across all of a subscriber’s web-connected devices. Approximately 100 linked HoofSearch listings from 20 or more countries each month connect registered users to all points of the equine veterinary medicine/science publishing compass. Subscribers can browse the list passively for general awareness or actively click through to journal pages for more options. The index contains peer-reviewed journal articles, conference proceeding abstracts, master’s and doctorate theses, and international patent announcements. The monthly lists carefully differentiate Open Access papers from those requiring subscription/library sign-in by using color-coded access labels. 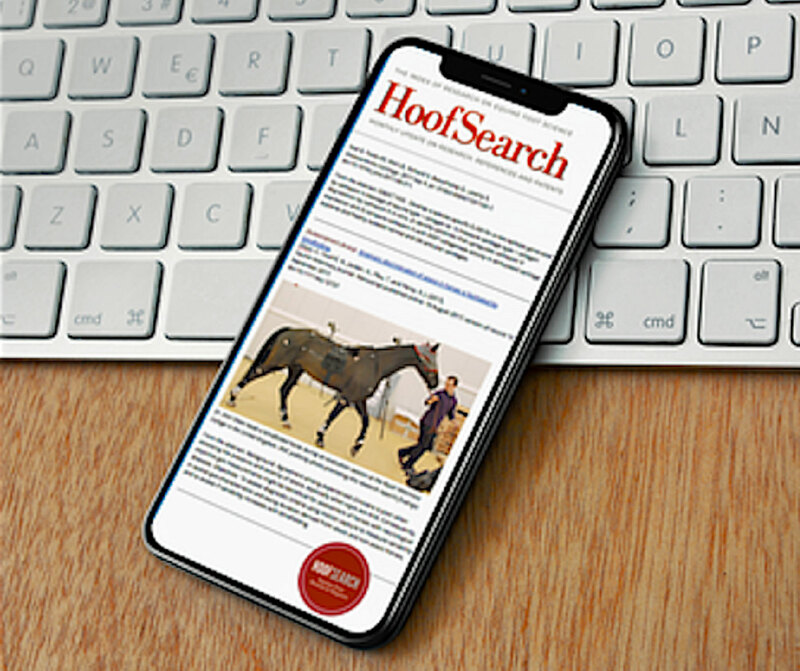 HoofSearch can be viewed via free Google-based mobile apps for smartphones and tablets as well as via its desktop/laptop browser-based version. It can be used on the road, as well as in-clinic, requiring only internet access and a browser.